I’m really sorry that I haven’t updated for a while. I’ve been really busy with other stuff (including being sick), and haven’t been doing (much) cooking. This post will be fairly long, though, to make up for my previous absence. 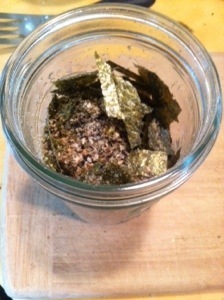 I’m going to be showing you how to make vegetarian furikake, which is a Japanese topping thing for rice and stuff. It’s super delicious. This is for a fairly large batch of it, since I use it pretty frequently. Just halve the recipe if you want to make less. I start out with a half of a cup of sesame seeds. You can just use regular (white) sesame seeds, but using, as I do, a mix of 2/3 white sesame and 1/3 black gives a deeper flavour and colour. 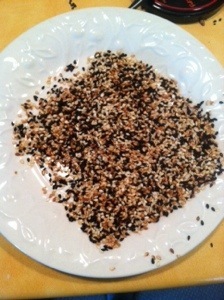 Next, I heat up a cast-iron skillet and put about half (probably a little over) of the sesame seeds in it, to toast them. They should look something like that when they’re done. I just put them on a plate to cool. 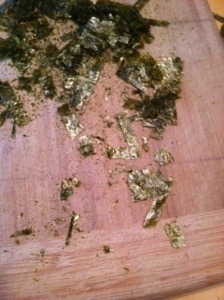 I then toast four sheets of nori on the pan, just till they get fragrant. It doesn’t take more than a minute. Here’s where things get a little complicated. You can do it in a simpler fashion, but I like doing it this way, since I think it makes it more flavourful. In any case, I take half of the toasted sesame seeds, half of the un-toasted sesame seeds, half a teaspoon of salt, half a teaspoon of sugar, and a sheet of the toasted nori, torn into pieces, put it all in my coffee grinder (a very multi-purpose tool, as I’ve said before), and whiz it up a few times, till the sesame seed-bits are about a quarter of the size the full seeds are. I then put that in the bottom of a 16-ounce mason jar. 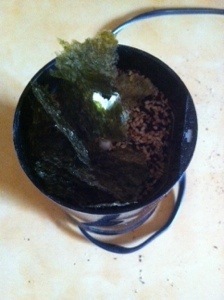 For the remaining three sheets of nori, I cut them up into around 3/4 cm by 2 cm strips. Looking back on it, though, I realized that I should’ve just used scissors, as that would’ve made it a lot easier than using a serrated knife. 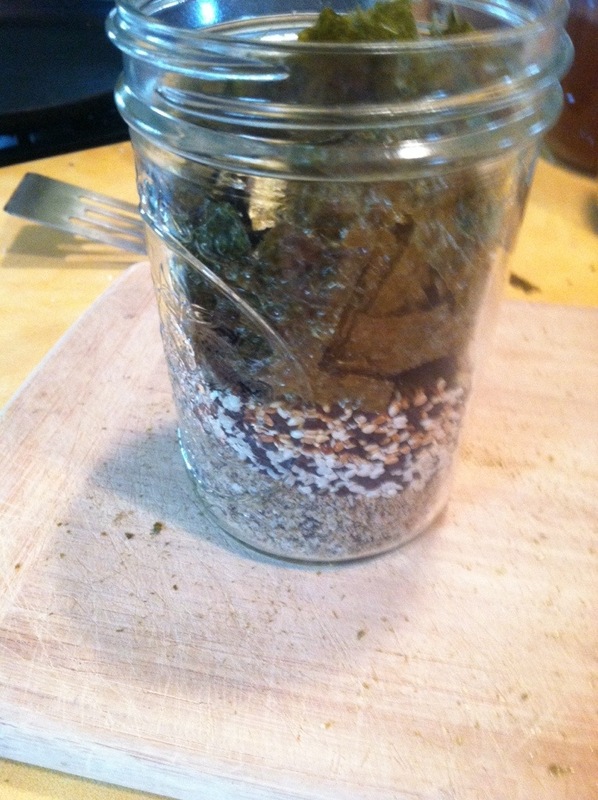 Put the other half of the toasted sesame seeds, the other half of the un-toasted sesame seeds, and the nori strips in the mason jar as well, then add another 1/2 teaspoon of salt and sugar, each. 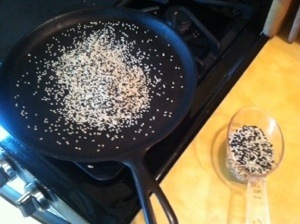 Then just shake it up and sprinkle it on some rice (Japanese rice, preferably). 12 May	This entry was published on May 12, 2014 at 12:15 pm. It’s filed under Japanese, Uncategorized, Vegetarian and tagged andrew, condiment, furikake, japanese, nori, recipe, sesame, vegetarian, vochman. Bookmark the permalink. Follow any comments here with the RSS feed for this post.